As a high school teacher and coach, I've attended a lot of sporting events. From football to basketball to softball, and more, I've spent hours and hours leading, encouraging, and challenging young athletes. As I watch them play, it takes me back to my own days of organized competitive sports: of softball cleats, jump shots, and track spikes. Of being shaped into who I am now. These kids may not know it, but they're learning far more than how to throw, shoot, swim, or run. They're learning things that will follow them for the rest of their lives. Yes, competition is great and success is fun, but there is so much more to it all than simply winning. 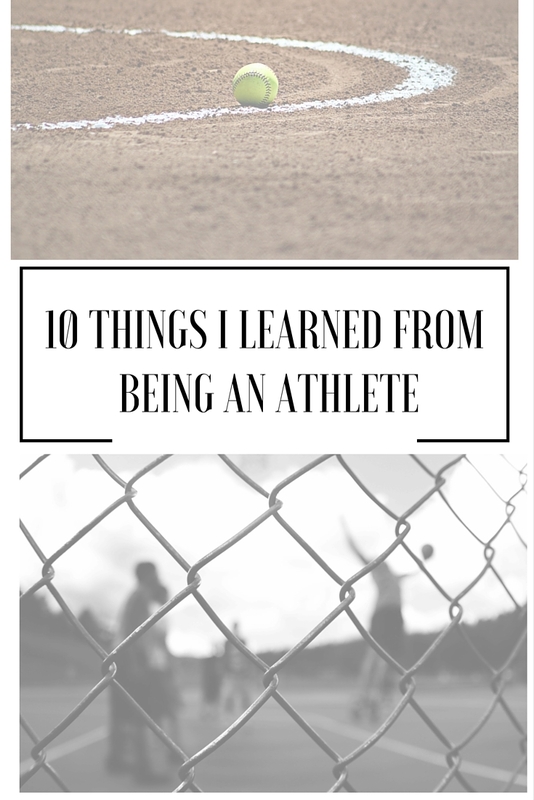 Here are ten things I learned from being an athlete: things that are still life applicable to this day. 1. Keep your head up. The power of a positive attitude can go a long way. You can't lose your cool in the middle of a game, or you're already defeated before it's even over. Sports helped me to think positively when we were down a few runs or points, and it challenged me to share that positivity with others. Even now, I'm one of the most positive sports fans you'll see, as I always have hope (within realistic reason) for my team to come through in the end. And this positivity can be beneficial and contagious in all walks of life. Be the positive thinker in your career, friendships, and neighborhood. 2. Challenge yourself to accomplish your goals. You can do more than you may think. When I was a freshman, I never thought that I'd be able to run a lap in less than a minute and a half. But my junior year, I ran my personal best with a 63 second lap. If I try to go do that now, I might die. And if I'm honest, I totally had a love/hate relationship with the 400 (one lap). But mainly, track especially helped me see that I could do a whole lot more than I ever thought I could. I learned how to push my body and my mental thoughts far beyond my wildest dreams. I learned that being strong and fit was possible and rewarding. I learned that sometimes things are hard and they hurt, but that they pay off in the end. I learned to set goals and to celebrate them when I accomplished them. And you know what? The same is true in life. It can hurt. It can be hard. But it's worth it. So set goals, push yourself, and watch them happen. 3. Make your time count. Four years of high school go by quickly. Some people go on to play sports in college, but many don't. Even so, the years of regular competition quickly come to an end. I tell my athletes to never take a second for granted, and you can ask any high school senior who just lost their final game: it goes fast. So make your time count. Make it something you can be proud of. Leave it all out there on the field, the court, or in the pool. Don't have any regrets. Play your heart out, and give your best. I learned to do this in every single game or meet that I had. And it always felt good knowing I had given my all. The same can be said for our lives. They go quickly. Years pass, life changes, seconds turn into minutes and days. And we only get to do it once. So make it count. 4. Work together. Put the team above your own desires. Sports taught me to be less selfish. I led our basketball team in assists because I recognized that my stats were much less important than our overall win. I learned to love sac bunting or hit and runs in softball. I learned to love helping our team, and not just myself. Sure, it felt good to have my own success, but if I had a rough night and our team still won, then that was a good day. I learned how to navigate teamwork with others and to lead with humility while walking alongside younger teammates or those who were better than me. I learned the beauty of "we" over "me". And this is still so very true in life: in work, in relationships, and so many other areas. 5. Sacrifice is worth it for what you love. There will be times in life when you've got to sacrifice something: sleep, money, friends, time with others. But it's worth it in the end if it's for what (or who) you really love. I had to miss out on a few family trips because of my sporting events. I also had some nights where I didn't get much sleep after a long away game. But this idea of sacrifice from long practices or the inability to hang out with my friends has followed me on to make sacrifices for my health, marriage, family, and faith. I was the cool kid who was doing homework on the bus or during the freshman games. But you know what? I was a three sport varsity athlete who was in the musical and show choir, and I still managed to keep my 4.0 GPA. And now? I can juggle teaching, coaching, YoungLife, NHS, and life with a lot less effort and a lot less stress because it's something I've learned how to do ever since high school. 7. Listen and communicate well. Holy smokes, is this life applicable or what? In careers, marriage, parenting, friendships, and more, you've got to be able to both listen and communicate or you are going to struggle mightily. Same goes for both on and off the field. I had some hard conversations with my coaches as an athlete, and those helped me learn how to advocate for myself while also remaining respectful to those in authority over me. Not to mention, I learned how to handle conflict and how to talk it out in person. These life skills have come in handy multiple times since then, and seem to pop up on a regular basis. Not everyone can be the all-star. Sometimes, a supporting role is just as important and necessary. Know your role, and be the best at it that you could ever be. Whether it's in the workplace or on the court, there is a need for everyone to contribute to success. Don't think any less of yourself if you aren't the star, and be proud of the role that you're filling, even if no one else ever recognizes you for it. All eyes are on you. Nobody likes someone who's cocky. Learn how to both win and lose with grace, and never lose your cool in a moment of emotion. There's a lot to be said about a person who can play the game of life with class. People are always watching, whether they are parents, colleagues, students, coaches, or kids. We've got to remember that we could be someone's role model...and what are we teaching them through our actions and words? Some of the games I learned the most from were the ones I lost. Why? Because they kept me hungry. Because they forced me to think about what I needed to change or work on. And because they made me realize just how much I truly did care about and love the game. In life, we're constantly learning from our failures, which can help turn something negative into something much more motivating and positive. It can push us on to get back on our feet and try again, while using what we've learned for our previous mistakes. These are the things that I hope my high school students and athletes truly learn from the game. Winning is fun, but it's not the only thing that sports are about. I know without a doubt that being an athlete has made me a much better person. It taught me so many things, served as as perfect outlet for my competitive nature, helped me release stress, and gave me a fun reason to stay healthy. I still work out daily and challenge myself on a more individual basis, but overall, I'm thankful for the lessons that I learned from being an athlete. It's an experience I wouldn't trade for the world. I'm linking up with Motivational Monday, Modest Mom Blog, What Joy is Mine, Tell it to Me Tuesday, Bliss and Faith, Sweet Little Ones, Testimony Tuesday, Intentional Tuesday, Twinkly Tuesday, Women with Intention, A. Liz Adventures, The Diary of a Real Housewife, Uniquely Unfolded, Momfessionals,Life in Leggings, and Quintessential Mommy. I already see a difference in the work ethic of a lot of my athlete students vs. non-athletes, and I know it's only going to become more obvious as they get older. They're building so many useful life skills and they don't even know it! Thanks so much!! I agree- they need to play! Such a great list and so many valuable lessons. I think playing sports and being on a team is so incredibly important. 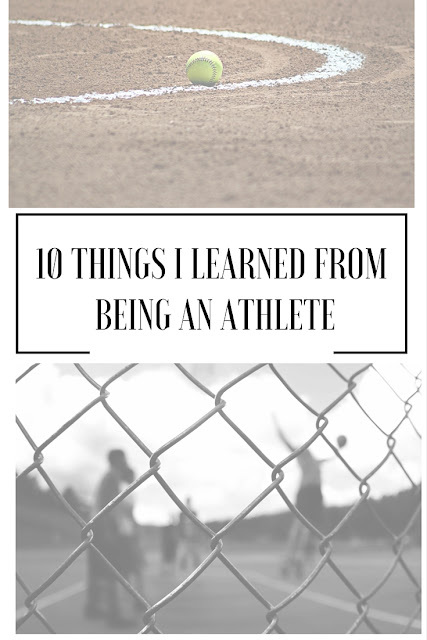 My husband and I talk all the time about which sports we hope our kids want to play and how to make sure they learn all these lessons. We do too (and we don't even have kids!) Thanks for reading! I can definitely relate. I played basketball through middle and highschool. There was so much to learn about myself and about the game, and I also learned a lot once I stopped playing in college. These are so true, Kelsie! 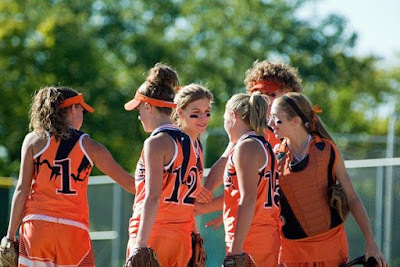 Being an athlete, and especially participating in team sports, teaches so many life lessons. I hope Selah experiences the joy and learning of being an athlete someday! I agree :) So fun- she could be an all-star! I totally agree! I was field hockey player in college and I feel like it shaped my career in medicine. Your post makes me miss being an athlete!!! I am going to share with my students; I have a lot of student athletes who I believe would greatly benefit from and connect with this post. Those are wonderful life lessons. I watched my oldest child learn a lot of those same lessons by being a musician. Thanks so much! Music can definitely help with these too! Make your time count FOR SURE! Love this! I definitely believe that sports can teach you so much about your self. I love this. I was also a high school athlete and the most important thing I learned was to be tenacious in what I want to achieve. 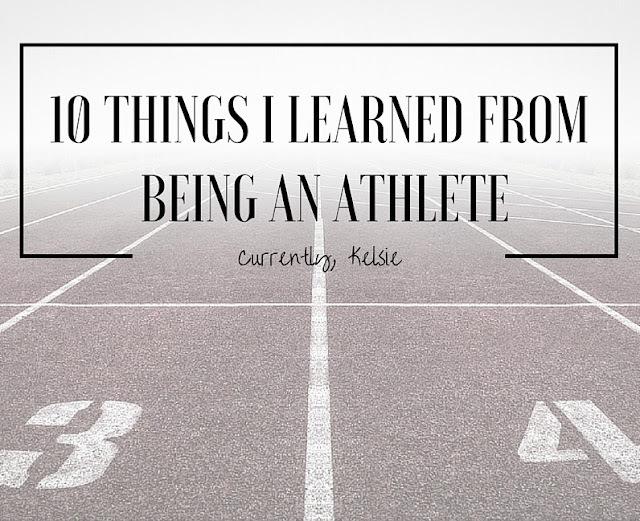 I was never an athlete, but these are definitely very important lessons to learn! I wasn't an athlete in high school but these are important things! Learning from failure is something people need to really try and do, no matter how big their ego is! It truly helps and you can learn WHAT NOT TO DO in the future! I was definitely the kid who was super active in sports (and everything else) in high school. Multi-tasking is the truth, and I honestly don't know how I did it! Dance team (which is a year-round sport), soccer, band, musicals, etc AND school and a part time job! Absolutely! Way to go! I've alway wanted to do a half, but I've never quite committed to the training. I miss my sports days for sure! These are great! 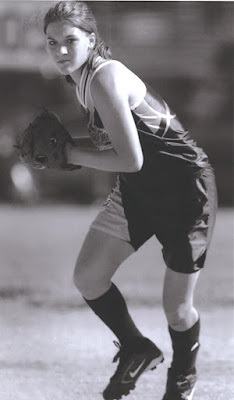 I look fondly back on to my years playing softball and dancing. I learned so much from them and they really have shaped me into the person I am today! Thanks so much! I look back on them fondly too! I read your post to my younger son as he is an aspiring athlete and I try to instill in him as much as I can the importance of team work and confidence. Thanks!! Love this. I miss being a student athlete so much, but it has impacted me way beyond the field! 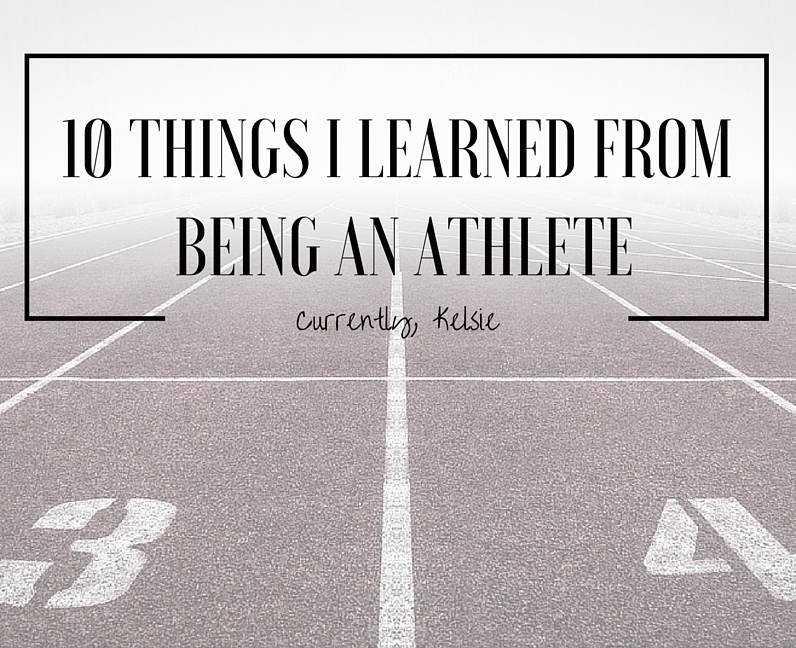 In my experience, being an athlete made me a better student and person in general. So many lessons learned on the court. Thank so much! I miss it too! YES to all of these! Oh how I miss my days of playing sports! While I miss playing basketball, the lessons I have learned from playing have definitely shaped me to be the person I am today. I miss those days a lot too. Thankful for all I learned. LOVE this post, Kelsie! Though, I wasn't a "sport" athlete - being a dancer has taught me all of these things, and more. It's crazy what something you love can really do for you! Thanks, Summer! I can see how you would learn these all from dancing! Thank you! I miss sports for sure! It's amazing how quickly the athletic ability disappears when you stop training, but also amazing how quickly it can come back, it really is like riding a bike. Discipline. The one thing I definitely take with me from all 3 activities is discipline... that and the importance of good posture/body awareness! oh, and that scar on my leg from a field hockey stick... totally worth it! Yes to all of these. I definitely miss competitive sports, the rec leagues just are not the same.